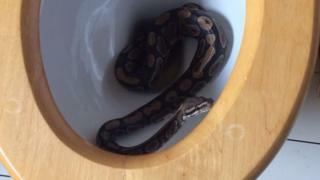 A five-year-old boy was shocked to discover a python inside his toilet when he lifted up the lid. He was "frantic" when he found it in the bathroom at home in Southend, Essex, his mother Laura Cowell said. Specialists from pet shop Scales and Fangs came to the rescue, removing the harmless 3ft (91cm) baby royal python. "It smelt of bleach and a bit toilet-y," Ethan Pinion from the store said. The snake "most likely came up the u-bend" and is expected to recover fully. Mrs Cowell said the toilet had been "blocked for several days and the water wasn't draining well", but at the time, she did not know why. Her son discovered the unwelcome visitor when he went to use the toilet on Wednesday. After phoning several potential rescuers, Rob Yeldham, who owns the Leigh-on-Sea store, came to help. "I've done many snake rescues in my 10 years, but I've never had one in a toilet before. It's definitely a first for us," he said. Which animals can swim up the u-bend? Mr Yeldham said some neighbours of Mrs Cowell had recently moved and old vivariums were left outside with the rubbish. "I think the snake probably escaped and went down their toilet, and ended up in this one, as all the sewers are connected," he said. It was unlikely it had been there long as it was healthy and not underweight, although it is suffering from scale rot, "probably from the bleach". The snake is being treated at the store and once "in perfect health" will be "rehomed with someone reputable so he won't end up in a toilet again". Mrs Cowell said she was "petrified" and put weights on the toilet lid for several days after the experience. Which animals can swim up your toilet?